Status: Constituent part of Georgia. Notes: The Adjaran ASSR was created in 1921, largely for political reasons. Firstly, it prevented the Georgians from exercising full control over the port of Batumi, and served to encourage supposedly pro-Communist elements amongst Adjarans (or "Lazis") living on the Turkish side of the border. The Adjar are a Georgian ethnic group at the south-eastern coast of the Black Sea. They became Christians in the 4th century and got part of the Kingdom of Georgia in the 9th century. Since the middle of the 16th century they have been under the rule of the Turks, who islamized the Adjar. The Adjar were integrated into the Russian Empire in 1878. The language of the Adjar is an east Caucasian language. The writing language is Georgian. The Adjar are Sunni Muslims. Interfax Agency announced (20 July 2004, 22:20) that the Supreme Council (Parliament) of the Autonomous Republic of Adjara at the first session on Tuesday on 20 July 2004 had ratified the "Law about the Flag of the Autonomous Republic of Adjara". The flag has seven dark blue and white stripes, and in the upper corner the national flag of Georgia with the five red crosses. The dark blue stripes symbolize the sea whereas the white stripes symbolize purity. Photographies of the flag can be seen on the Adjara government website and on Flickr. The canton with the Georgian national flag stretches over three vertical stripes (and not over four or five stripes as it had been reported earlier). Following the Rose Revolution and the overthrow of President Eduard Shevardnadze in November 2003 in Georgia, during which there was extensive use of the "five-cross flag", which became official after the accession of the new President Mikhail Saakashvili, there was a nationalist movement toward unification of the diverse regions. During the subsequent May 2004 protests against their leader Aslan Abashidze, Adjarans also used the five-cross flag. Abashidze was then overthrown in what many considered a "Rose Revolution" of their own. Saakashvili was welcomed, and Adjara was reunited with Georgia. So it will hardly be surprising that Adjarans decided to place the five-cross flag in their canton. Unlike most of predominantly Christian Georgia, however, Adjara is majority Muslim. So it is notable how Adjarians have adopted the five-cross flag as their own, even incorporating it into their regional flag. This is only to emphasize that the flag, despite its crosses, has a nationalist rather than a religious meaning to Georgians. BatumiNews (page no longer online) reports a failed attempt to hoist the new flag of Adjara in the village of Gonio. An attempt of hoisting the so-called "five-cross flag" failed in Gonio, while a group of certain forces were trying hard to reach the top of the Village Council of Gonio. The group members, quite a few though, besides the attempt of hoisting the flag, urged for the change of the Adjara Autonomous Republic Government. As was reported, the local population stymied the process, another version goes as law enforcers of the Adjara Autonomous Republic intervened with the gang of squabblers. 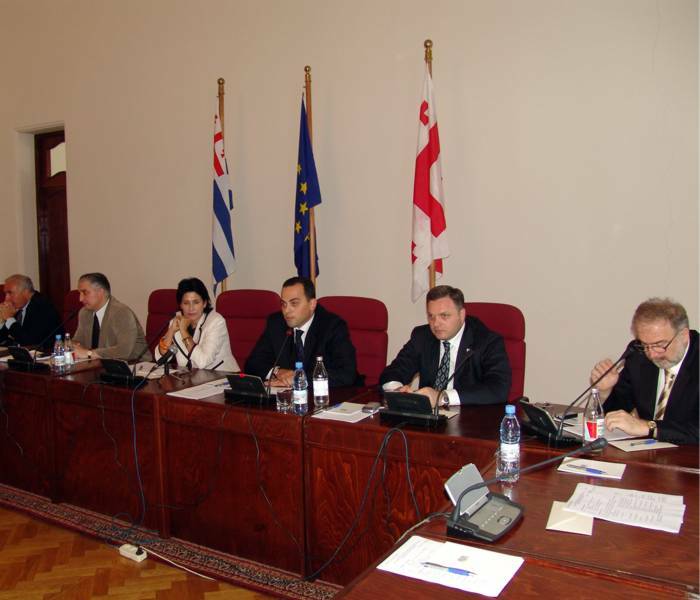 BatumiNews contacted for the comment press service of the Adjara AutonomousRepublic Ministry of Interior. David Gergedava, chief of the press service ruled out any foray on behalf of the law enforcement structures. "The squabble took place among the local population and the group which tried to hoist the flag of the Nationals". The population was compelled by the brute force of destabilizes. The camera belonging to Rustavi 2 was dispossessed temporarily, though the cameraman gained it back through the police assistance.